Buy One, Get One Half Off when you enter code HDBOGOHO at checkout. Limit one half-off item per purchase. See details. Indulge in sweet perfection with four juicy Royal Verano® Pears wrapped in pretty pink foil, accompanied by our new ruby cacao truffles. 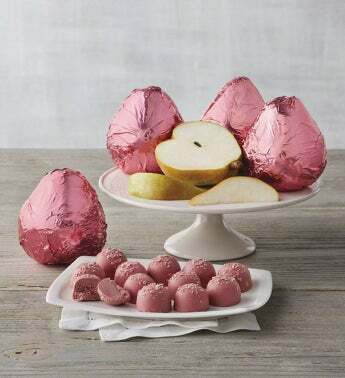 Boasting a subtle taste of berries and a natural hue, these creamy pink truffles are an exciting new twist on a well-loved treat. When paired together, this delicious duo makes the perfect gift for fruit fans and sweets lovers alike.